There was a time when point and click adventure games were some of the most popular games available. In the old days games like Monkey Island, Day of the Tentacle, Sam and Max, and many more helped make this genre what it is. Today the genre has had changes made to it to make things a little easier for players. The games that Telltale Games puts out is just one example of this. While games like Monkey Island are thought highly of many players found them too hard to figure out the solutions and no one likes having to use a guide for a game like this. 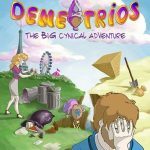 Now there is a new point-and-click adventure out for the PlayStation Vita called Demetrios: The Big Cynical Adventure. It’s heavily inspired by those old classics but is it worth playing? 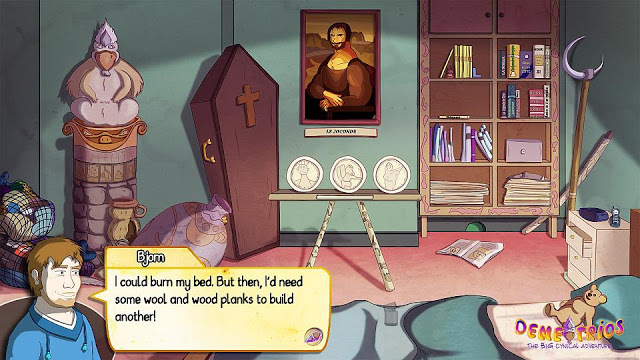 In Demetrios you play as a man named Bjorn Thonen. Bjorn isn’t really your typical protagonist as he isn’t nice, is a bit overweight and probably not the cleanest guy you want to hang around with. He works with antiques which leads to this whole story kicking off leading him on an adventure across the world. When it comes to playing the game you move the cursor with the left stick on the Vita while the right stick allows you to look at things more closely. Pressing and holding the Square button meanwhile will highlight objects in the environment that are of interest. So in the control department Demetrios works as you would expect for this type of game and they don’t get in the way. The story of the game is pretty good and full of humor although it’s the kind that may or may not be to your liking. The humor is generally dirty and juvenile and while I found it funny at times it did kind of get to be too much by the end. If you generally enjoy that brand of humor though you’ll love what is in this game. Also I should mention that there is an option to turn it off so don’t let that be a deal breaker if you were interested in playing this game. Just to give you an example of this humor in a certain scene in the game you’ll be able to pee on a plant in front of some guards. Another scene you’re able to make him take a crap in a sink. One of the things that turns people away from these adventure games is difficulty. Thankfully while Demetrios is challenging it felt right to me and never I never felt like I needed to go look up solutions on the internet. If you get stuck there is a system in the game that can help you in Cookies. 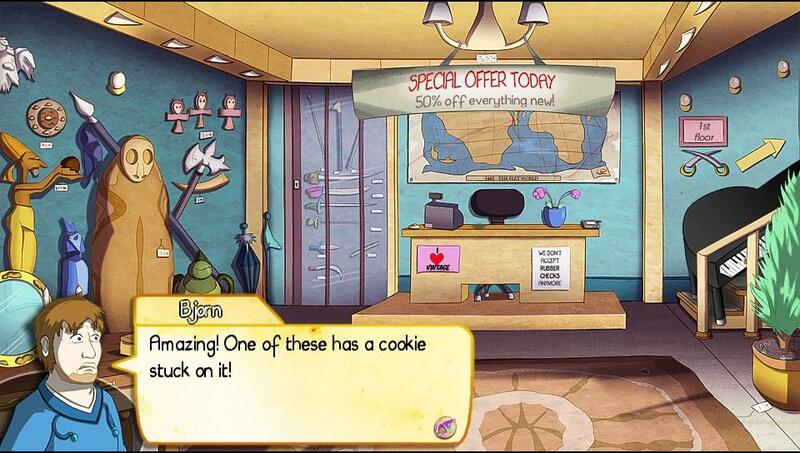 Cookies are something that you can find in each scene in the game and can be consumed to provide hints as to what you are supposed to do. Because they are something you have to find and they are limited it makes it so you can’t cheat your way through the game but I liked that it is there as an option to assist you instead of having to go look things up. Demetrios graphic style and sound design is good as well. Everything is colored nicely and audio work is good enough. The game had some issues with the save system but they have since been fixed in a patch. The game took me around seven hours my first time through but it could be longer or shorter depending on how fast you can solve the puzzles. The game has 36 trophies including a Platinum to work towards that can encourage some replayability. One of the trophies is for getting every possible game over screen that will have you getting Bjorn killed in every possible way as well as other things. Another asks you to find all of the cookies. 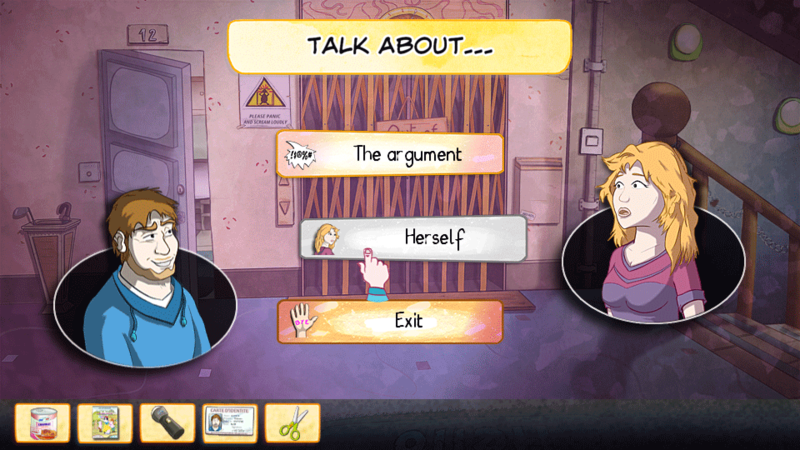 By the end of the game I was glad I got to experience Demetrios: The Big Cynical Adventure. It’s a fun point-and-click adventure game full of humor. Fabrice Breton, the lone developer who created the game, has clearly been inspired by other great games in this genre and for the most part has made a great one himself. The humor does get a little tiring at times but it never made me want to stop playing the game. Since it’s on the PlayStation Vita it’s the perfect game to take with you on the go to play or for playing while laying in the bed. The game isn’t too easy or too hard instead kind of hitting that middle ground to me which to me was just fine. 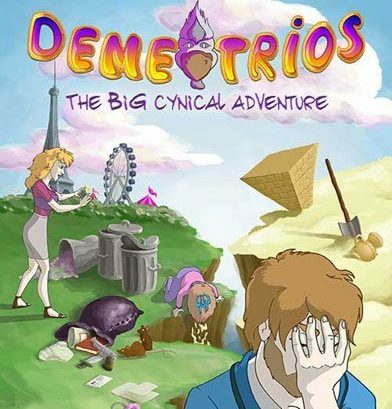 If you have $10 laying around and want a fun romp to play on your Vita then Demetrios is certainly worth a look.